Alex Shikany is vice president of AIA at the Association for Advancing Automation (A3). AIA — The Association for Advancing Vision + Imaging — is the world’s largest machine vision and imaging trade group, with over 380 member companies. Also a member of A3’s senior leadership team, Shikany presents to a variety of audiences worldwide on the benefits of machine/computer vision, robotics, and automation. He also heads A3’s business intelligence and market research activities. 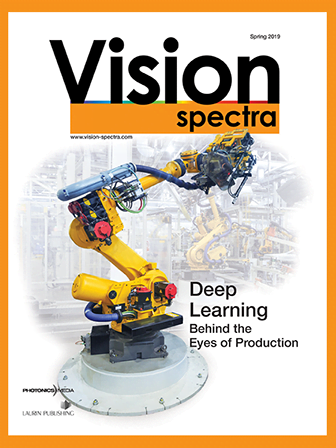 Machine vision is mature compared with factory automation, yet it’s experiencing a renaissance outside of the traditional manufacturing environment. In what sectors are we seeing growth? For traditional machine vision technologies, areas like the life sciences, consumer electronics manufacturing, and agriculture are expanding. Imaging technology as a whole is being incorporated into just about every new product we see released, from autonomous vehicles and drones to smartphones and VR headsets. What is your prediction for the vision market in 2019 and beyond? Macroeconomic indicators are pointing to the industry softening this year, that’s true, so I expect low-single-digit growth numbers in 2019. Beyond that, we could experience further downward pressure on the manufacturing sector if there is a recession in 2020/2021, as we’ve heard economists such as Alan Beaulieu from ITR Economics tell us. Longer term, the industry will continue to grow rapidly. The overall trend is toward smart systems, either in the factory or in our homes. Smart systems need good data inputs to operate, and imaging technology is one of the primary ways they can get it. What’s your assessment of the mergers and acquisitions environment today? We’re definitely seeing an increased level of activity versus a few years ago. Larger automation suppliers such as OMRON and Rockwell expand their machine vision portfolios, and I see that trend continuing. There is also substantial interest from the venture capital and investment communities that are watching our market closely. It remains to be seen how much of that interest will translate to further merger and acquisition activity in the short to medium term, but I personally believe we’ll see more of it. What industries do you see embedded vision having an impact on? In the embedded vision space, hardware and software advancements alike are allowing for smaller, low-power, affordable imaging technology to be integrated into a growing number of solutions. We’re seeing this in areas such as robotics, autonomous vehicles, consumer electronics, the life sciences, and agriculture, where cameras can be embedded into robot arms, cars, smartphones, microscopes, and drones to a greater degree of success and affordability. That point on the optical axis of a lens, to which an incident bundle of parallel light rays will converge.